If you have a tooth weakened by decay or damage, a dental crown can restore the strength and appearance of your smile. Dental crowns, or caps, fit over the tops of teeth to provide support and restore proper function. At Dental Health & Wellness of Long Island in Northport, NY, we provide highly aesthetic crowns tailored to fit into your unique smile. Dr. Steven Lamberg uses a wide range of advanced materials to ensure your crown is both strong and beautiful. In addition to using crowns to support a weakened smile, Dr. Lamberg can attach a crown to a dental implant to replace a missing tooth. 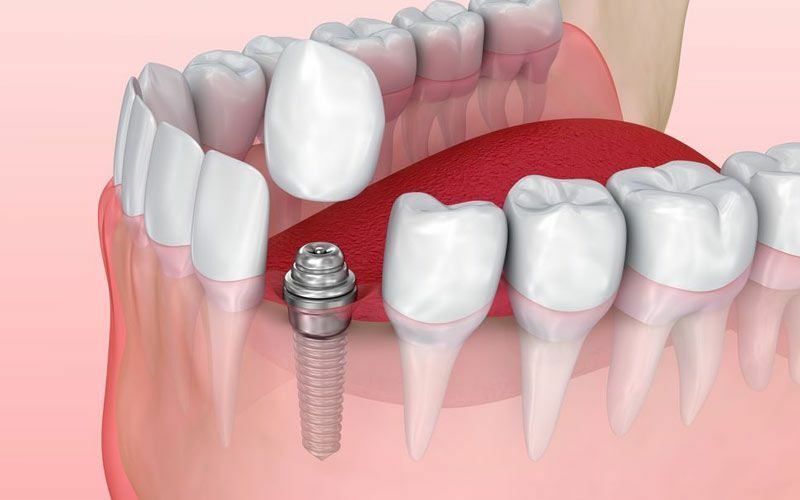 A crown and dental implant can be used to replace single missing teeth. Dental crowns are highly versatile and can provide cosmetic enhancements for your smile in addition to improving your oral health. Our crowns are crafted from beautiful, tooth-colored materials, allowing them to blend seamlessly into your smile. Before recommending a crown, Dr. Lamberg will first perform a comprehensive evaluation of your oral health to determine if a crown is the right treatment option for you. At Dental Health & Wellness of Long Island, we use a wide range of materials, including zirconia, lithium disilicate, and pressed porcelain. Dr. Lamberg can choose the material which suits both your aesthetic goals and oral health needs. It typically takes two visits to our office to receive a dental crown. During your first appointment, Dr. Lamberg will prepare your tooth for crown placement by shaping the surface of your tooth. This process ensures your crown will fit comfortably into your smile without appearing bulky or affecting your bite. Then we can take impressions of your prepared tooth and send the information to our lab. Each crown is carefully crafted to improve your oral health while complementing your natural aesthetics. The normal turnaround for a dental crown from our lab is about two weeks. We can fit you with a temporary crown to wear during this time to protect your prepared tooth. Once your crown is complete, you will return to our office for final placement. Dr. Lamberg will assess the fit and appearance of your new crown and ensure you are satisfied with the results. Then, he can bond the crown to your tooth for a fully restored smile. At Dental Health & Wellness of Long Island, we work hard to create dental crowns which look and feel natural. Each crown is carefully crafted to improve your oral health while complementing the natural aesthetics of your smile. Contact our office online or call (631) 261-6014 to speak to a member of our team today about a dental crown.